“My older sister was really into makeup when I was a kid and I would sneak into her room and play with all of her stuff. On Christmas morning, I would wake up at 6am, put red lipstick and eyeshadow on in my pajamas and be ready under the Christmas tree waiting. My first real obsession with makeup was when I collected the Stila lip glosses and Hard Candy nail polishes. That’s all I wanted. I’ve eased up on my makeup since then. I live in Venice [California] and my lifestyle is very easy. I spend a lot of time outdoors and I think I’m pretty low maintenance when it comes to makeup and beauty. As I’ve gotten older, I’ve found what works. Being natural works the best for me. Looking like yourself is ultimately what beauty is all about; bringing your natural self out and enhancing what you already have. I tend to go for the natural in my styling and in my real life – with both hair and makeup. If I find a product that I love, I stick with it. I guess I’m a creature of habit in that way. I do have a beauty routine but it’s stayed the same for a very long time. Except with skincare… that changes a little bit, depending on the season I may bulk up on the moisture. And I’m very low maintenance with hair too. I never blow dry my hair. I just put a little bit of Rodin by Recine Hair Oil on the ends and let it dry naturally. I do indulge in monthly face treatments. One of my best friends, Tarin Graham [of Michelle Peck Skin], is a facialist and she does microdermabrasion and oxygen facials. I feel very fortunate, ever since Tarin’s been a facialist, she’s been practicing and playing on me. View From The Topp is my fashion blog and Instagram. I’ve always been into fashion and I work as a stylist and I wanted to get my fashion perspective out there without feeling like I was making it too personal. I wanted something where people could really imagine themselves in it so that’s what View From The Topp became. I take photos of my outfits from the top down pretty much daily, and I create different scenes and use different backgrounds that correspond with my outfits. I recently did a collaboration/ Instagram takeover for Target that married Target’s aesthetic with my View From The Topp concept. 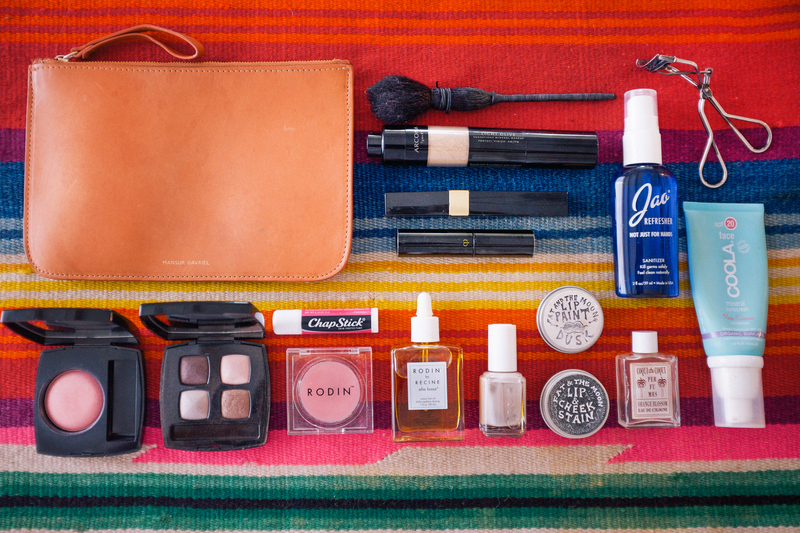 I use a Mansur Gavriel as a makeup bag. It came in my Mansur Gavriel bucket bag and I took it out and turned it into my makeup pouch. Jao Refresher Hand Sanitizer – I’m a clean freak and use this before I put any makeup on. It’s amazing; it smells like lavender and it’s all natural. Coola Rose Essence Mineral Sunscreen – I put this on top of my moisturizer, which is Dr. Lancer Nourish for summer. It has SPF 20 and a little tint in it to give you an even skin tone and a dewy glow. It’s really light, it smells good, and it’s good for your skin. Arcona Sunsations Mineral Makeup in Light Olive SPF 25 – I don’t use this all of the time but often when I’m spending a lot of time outside and my face is getting dewier, I’ll brush this over my face to give myself more protection and a matte finish. Clé de Peau Beauté Concealer in Ochre – I use this for blemishes and I dab a bit under my eyes if I haven’t slept enough. I’ve been using this concealer forever. My sister turned me onto it when I was younger. This is one of those products where when I like it, I stick with it. It’s expensive but it’s definitely worth it! Chanel Vitalumiere Aqua Ultra-Light Skin Perfecting Makeup in Beige Rose – I don’t use foundation on a daily basis but I’ll apply if I’m going out at night. This was given to me by a makeup artist that I work with, Jeffrey Rodriguez. He’s really into natural looking makeup like I am. I was always afraid of foundation because I didn’t want it to look too cakey, but since this is a water-based one it’s lighter on the skin. Chanel Inimitable Mascara – Mascara is probably the one makeup product that I would choose to wear. It’s also the one product that I am constantly switching and trying new ones. I have really long eyelashes and different mascaras do different things. Sometimes I go for a thicker lash but this one is pretty natural looking and, since it’s summer, I feel that a lighter, more natural mascara works for me. Rodin by Racine Olio Lusso Hair Oil – I use this stuff everyday. When I get out of the shower, I brush my hair and rub a little of the oil into my palms then distribute through the tips of my hair. I have short hair now and I like it to be sort of piecey at the ends and this is the perfect product for that. Coqui Coqui Orange Blossom Perfume – I went to Tulum a few years ago for my birthday with my boyfriend and we stayed at the Coqui Coqui. Right when you walk in, it smells amazing. They have a perfumery in the hotel and we actually went to their other hotel in Valladolid, a smaller town in Mexico, where they make all of their perfumes. I fell in love with this scent and I bring it with me everywhere. Whenever I wear this perfume, my boyfriend practically falls on the floor – he loves it so much. Essie Nail Polish in Sand Tropez – I always have this polish on my toes. Especially for taking pictures for View From The Topp, I find that it looks best if I just have a neutral toe because some of my shoes and outfits don’t match with different colors. And this light beige is the perfect nail polish to go with everything. Chapstick in Classic Cherry – Besides mascara, this is the other product that I can’t live without. I travel with at least three of them in my bag at all times. I really respect people who can wear lipstick and it looks great on them, but I feel like I’m dressing up and I’m a totally different person when I wear a lip. This stuff is moisturizing and gives you a tiny bit of natural pink color. Rodin Olio Lusso Lip Balm – If I want to add a little more shine or sparkle on my lips, I use this lip balm. It’s a really pretty light pinky shine, but not too shiny and it has a little bit of sparkle. Fat And The Moon Lip Paint in Dusk – It’s made from all natural ingredients like almond oil, beeswax, and Vitamin E. This is a light pink and I use a tiny bit over my chapstick because it’s a little drying otherwise. It gives my lips a light matte pink look. Fat And The Moon Lip and Cheek Stain – Again, all natural and dyed with beets so it has that beet red color. I’ll sometimes put a little bit on my cheekbones or in the center of my lip, sort of like a wine stain, just to add a little bit of color but still look natural. Shiseido Eyelash Curler – I used the Shu Uemura eyelash curler my whole life, but that is no longer so the Shiseido curler is the closest one that I could find. I curl my lashes probably three times a day because I have really long lashes and I like a big curl. Chanel Les 4 Ombres in Mystic Eyes – I don’t wear shadow during the day but at night if I go out, I’ll use a little of the brown/ goldish colors on the corners of my lids and smudge them to create a subtle smokey eye. It looks really natural, but still enhances my eyes and makes them pop a little more.